Return on investment (ROI) is an important aspect of property investment. If you are purchasing a property as a business venture, you must be sure of the potential returns. There is no point investing your capital and committing to a long-term scheme if there is no end-gain. The property market worldwide can be volatile – there is never a guarantee of a positive ROI. You could purchase a property and in 10 year’s time, it could have decreased in value due to a local or large scale economic recession for example. Thailand is no exception to the volatile nature of the property market – in decades past, prices have fluctuated greatly. In recent years, the property market in Thailand has stabilised and has shown steady growth with less volatility. 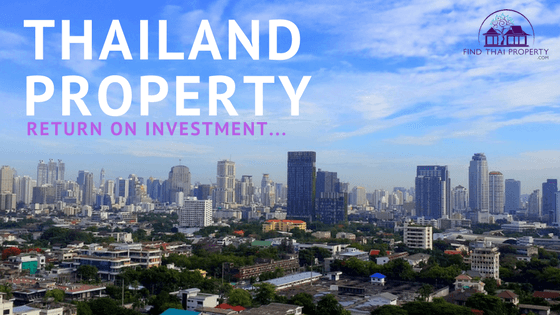 If you are purchasing a property in Thailand as an investment, or as a home, you should be aware of the potential ROI and the contributing factors to consider. If you do your research and choose the right property in the right location, there is no reason why you cannot make a strong ROI. If your property is run down and in a worse condition than when you purchased it you are not likely to make any profit – think logically and use your brain. Purchase the property at the lowest possible price. Keep the property well-maintained. Choose a desirable location that has great long-term viability. Choose a property that is attractive and will sell easily. Do these things and your ROI should increase. Now you understand some of the considerations to make that can affect your ROI, we will look closer at the expected ROI’s you can reap in Thailand. As you can see the average yield for apartments in Bangkok is between 5-8% – so if you rented a property worth 4.47m THB out for 5 years with an average rent of 23,000, you could expect a profit of 80,000 THB. This is a sizable short-term profit and this doesn’t account for property price increases or the final selling value of your property too. This is just a small snippet of info that covers a particular property type in Thailand’s capital – many other areas of the country have even better ROI both in the short and long term. The following are some other facts and considerations regarding Thailand property ROI. – Luxury properties in Bangkok also offer larger ROI’s. Generally, short-term ROI’s are lucrative, but are limited by the overall cheaper prices of Thai property and rental income – 5% is not an unrealistic minimum target for a 5 year period. If you do want to make a sizeable profit in a shorter period of time, it is advisable to either invest in upcoming areas or tourist locations outside of Bangkok. Managing risk becomes more difficult with this strategy. Long-term property investments also look favourable and while the Thai property market remains progressive. Popular areas with increasing infrastructure such as Bangkok, Phuket, Chiang Mai and Pattaya should all remain on the radar of property investors. As the government continues to promote foreign investment and improve foreigners’ accessibility to property, Thailand should remain a fantastic country to purchase property in.